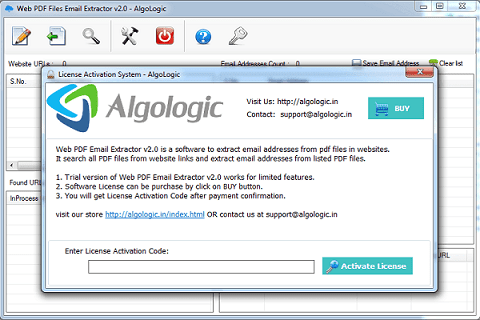 Web PDF Email Address Extractor v2.0 is a software utility to extract email addresses from PDF files from website-internet. 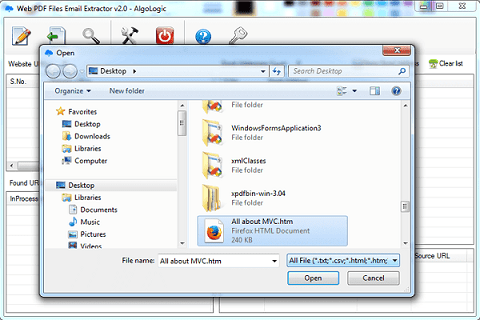 Web PDF Email Address Extractor v2.0 is a website PDF searching and email extractor tool which search all pdf files recursively in the given list of website urls and webpage links found in the urls. It skip all non required and blocked website urls from search to work much faster. It download all pdf files and extract all email addresses from all found pdf files. 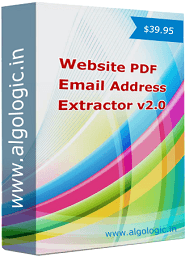 Web PDF Email Address Extractor v2.0 allows you to add website urls from .txt, .html, .csv, .xml files and urls parsing level can be set for searching pdf files and extract email addresses from pdf files. It is the powerful and fast email address extractor utility to extract email address PDF files from internet. Extracted email addresses can be saved in .CSV (OPEN IN EXCEL) and .TXT (OPEN IN NOTEPAD). 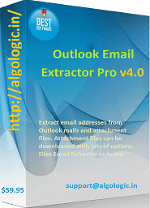 Web PDF Email Address Extractor v2.0 is available for free trial download for windows platform. Web PDF file Email Extractor v2.0 allows you to add website urls from files (txt,csv,html,xml etc.) to the urls list for searching pdf files and extract email addresses from searched pdf file links. You can add website urls to the urls list from text for searching pdf files and extract email addresses from searched pdf file links. Website is the links in the url link so searching could be infinite. Setting up crawl level of recursively searching pdf file links in link. It helps the software to give you the better result. Recommanded crawl level is 3-5 and can be set from Web PDF Files Search Settings window. It allows you to add blocked url keywords. Open Web PDF Files Search Settings window and click on Block Keyword Tab. Here you can add and remove keyword. The software skip all urls from parsing those contains the blocled keywords. After adding website urls to the url list, click on start button to search PDF file links and extract email addresses. Searched pdf files, file size and link would be listed in right-bottom list and email addresses would be listed in right-upper list. After payment confirmation, you would receive an Activation Code that is use to register the software license. Enter the License Activation Code in registration window and click on "Activate License" button. It would be varified from server, so internet connection must be available on the computer where you need to activate the software license. Our software license is single computer based so you can register the software license on single computer only. 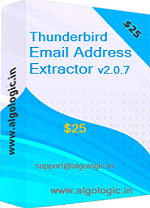 All File Email Extractor is a best email address extractor for extract email address from files as PDF file, word (DOC, DOCX) file, excel (XLS, XLSX) file, TXT, CSV, XML, HTML, ASP, INI, LOG etc. All File Email Extractor works for all version of PDF, MS WORD (DOC, DOCX) and Excel File (XLS, XLSX). 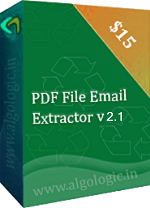 PDF Email Extractor is a software to extract email addresses from pdf files from your computer. Extracted email addresses can be saved in CSV and TXT file. It works for any version pdf files. Trial download available for Windows. 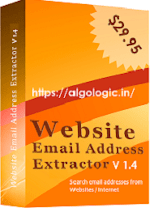 Website Email Extractor is a fast web email addresses extractor software to extract / find email addresses from internet from the given list of website's urls and internal url links found recursively upto defined level. 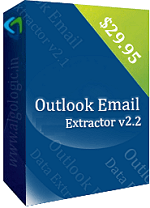 Outlook Email Address Extractor is a handy software to extract email addresses from Microsoft Outlook. It export all email addresses from recipients, cc, bcc and mail body of outlook emails of any mail folders. Free trial download available. 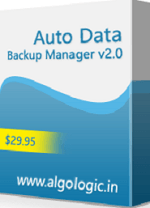 Auto Data Backup Manager v2.0 is a data backup software for windows platform, it can backup your files and folders automatically on scheduled date and time. It allows you to schedule many backup tasks. 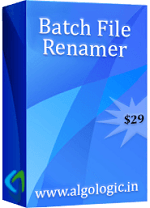 Batch File Renamer is a software for rename multiple files in windows with lots of file renaming options. It renames many files in batch by single click. Files rename preview and undo function is available. Free trial download available. is a software to extract plain text from many PDF files in single process and save in plain text (.txt) files that can be opened in any text editor. 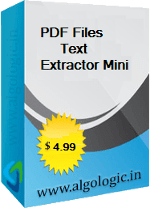 PDF Files Text Extractor Mini is a very fast software and process many PDF files in single process offline.